Calling all friends of 4-H….. Thursday, April 25 is 4-H's Day of Giving - a day to give back! For 24 hours, we will join together to celebrate the youth, programs, and potential of 4-H. We hope that you will consider donating to the RI 4-H Club Foundation, and help us provide important resources that will immediately benefit the wonderful programs, activities, educational experiences, and events that 4-H offers all year long. Our goal is to attract 100 donors - and any size donation counts! Those donations will go a long way in supporting the 1,800 youth that we serve. We know with a team effort and your support, we can make this happen. Let's do this! Click on the "How to Donate" tab at the top of this page, and then hit the "Donate" button. From there, just follow the instructions. In the memo line, please write "2019 Day of Giving"
In advance, thank you for your support! 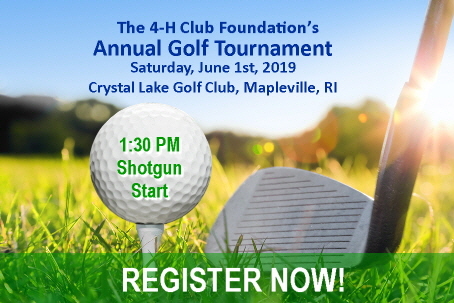 RI 4-H Club Foundation, Inc. The mission of the RI 4-H Club Foundation, Inc. is to support the youth programs of the URI/College of the Environment and Life Sciences. 4-H programs focus on learning opportunities for youth aged 5 to 19 years old, in school and in after-school settings, community clubs and Operation Military Kids initiatives. Educational programs focus on science, technology, healthy lifestyles and citizenship. The 4-H Foundation funds these programs, and provides scholarships, awards, recognition and travel opportunities. Donors are individuals, businesses, foundations and organizations who value the educational opportunities 4-H has to offer. The Foundation is a non-profit foundation incorporated in the state of Rhode Island. It has 501(c)(3) status which means that people and businesses who make donations may be able to deduct the amount of the donation from their federal income taxes. Please see our "News and Events" tab for upcoming events and news articles! Finally, our heartfelt thanks to our 2018 Donors and our 2018 Golf Sponsors!